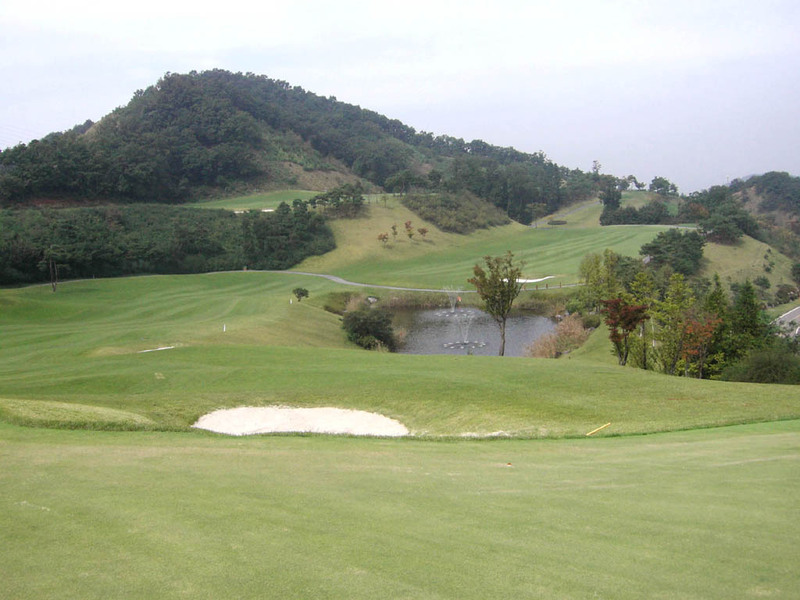 Hillside course with 27 holes consisting of three nine holes called Pine, Creek and Valley. The popular combination is Pine and Creek. 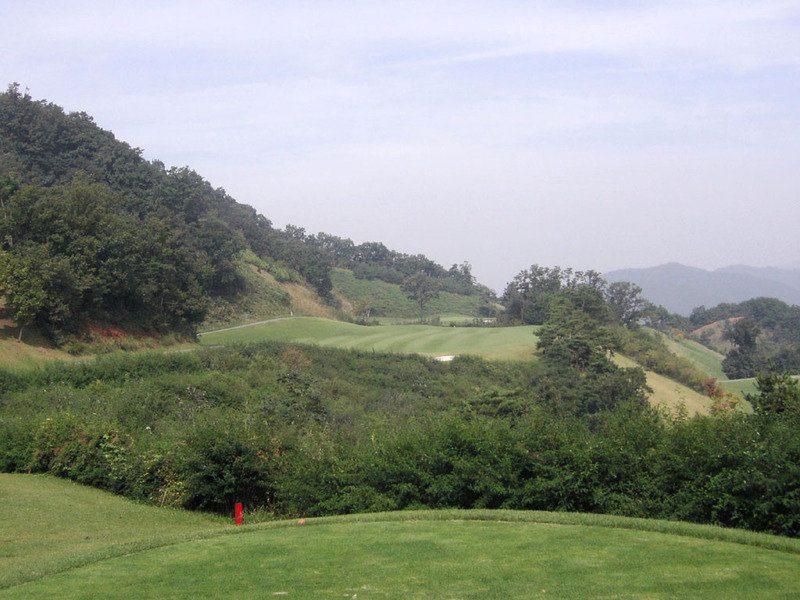 On top of the variety of lies and flow of the fairways, such as uphill, downhill, dogleg to the right and the left, numerous kinds of hazards, such as mountain, valley, lakes, creeks and bunkers, appear one after another making the course challenging and interesting. 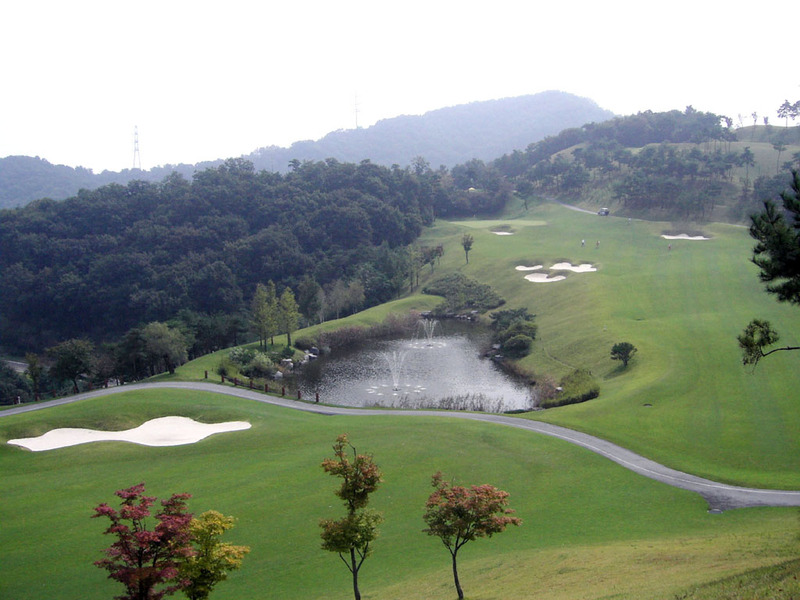 It is as if the course designer is asking the players “how are you going to conquest the hole?” at each hole. 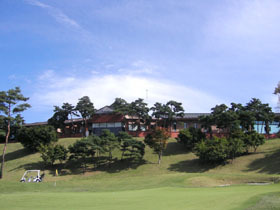 As one of the nine holes is called “Pine”, there are many pine trees on the course. The greens are relatively small. A slightly dogleg to the right. 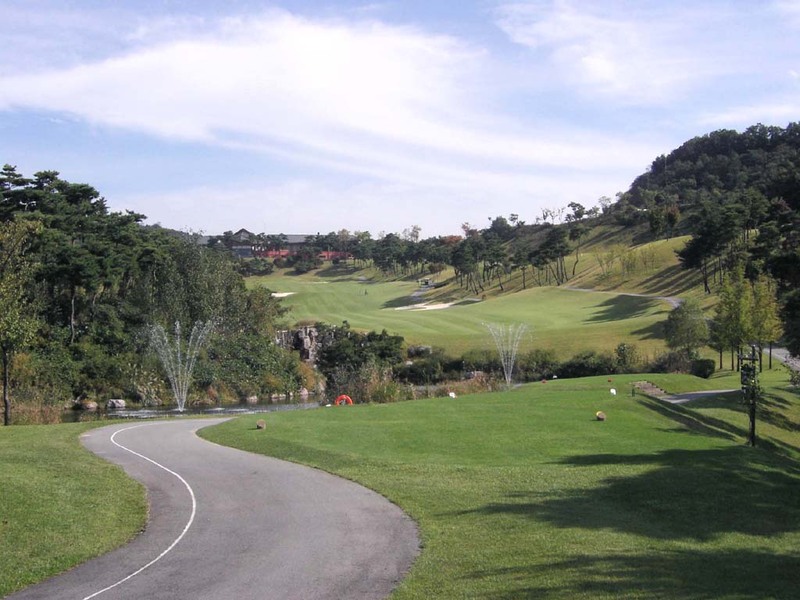 Tee shot is over a valley followed by slight downhill for the second and third shots. A wide bunker waits in front of the green. 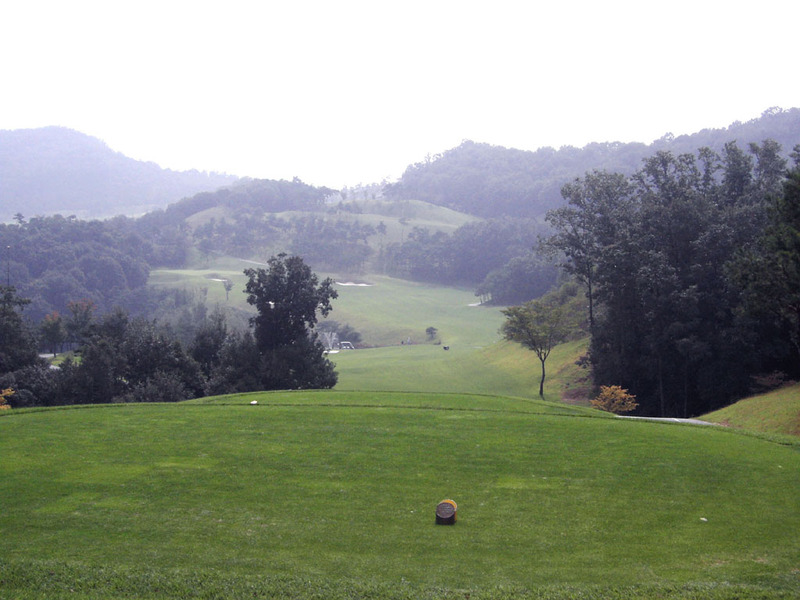 The green is slopes from the center to both right and left. 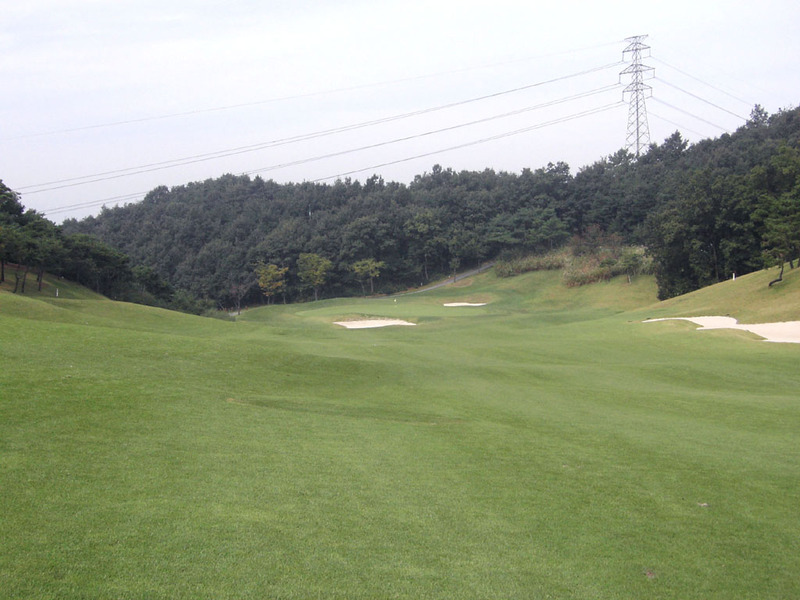 A long challenging Par 3. There is OB on the left. 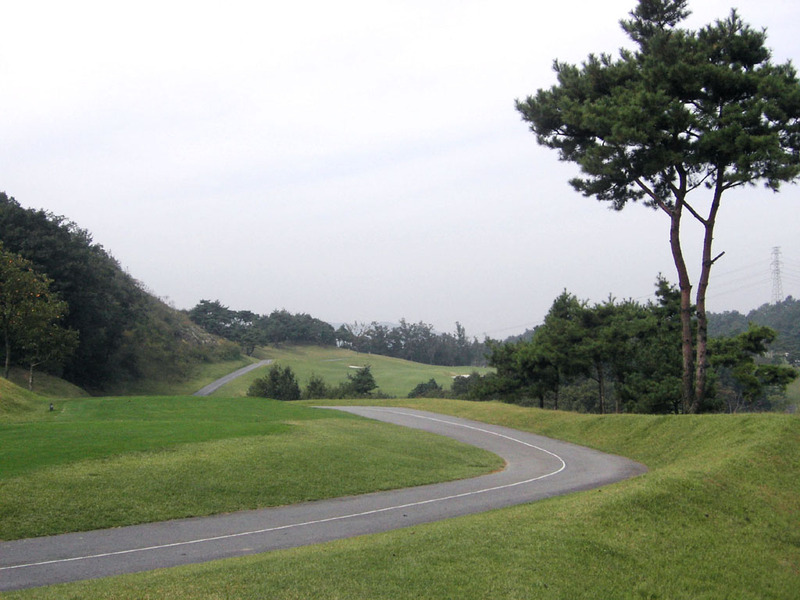 The green slopes from right to left. Almost straight, but difficult hole. 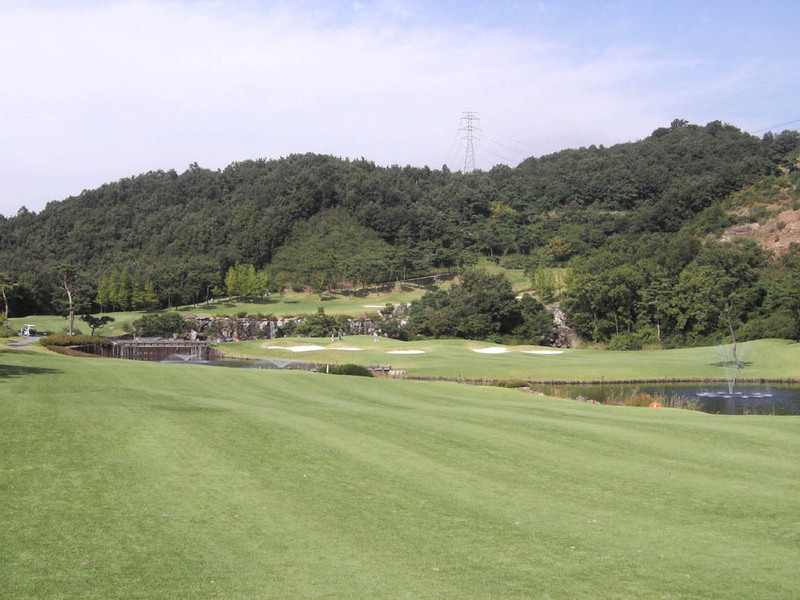 Players need to hit at least 210 yards carry to go over the valley. The narrow fairway has OB on the right and trees on the left. 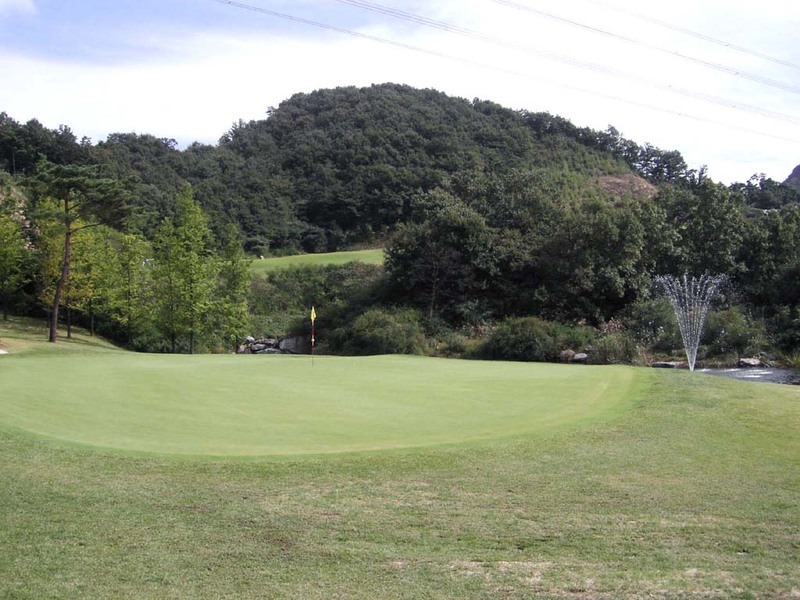 Since the second shot is over the valley again, the players need to choose a right club which can reach the green for sure. Amazingly designed hole by taking advantage of natural setting. 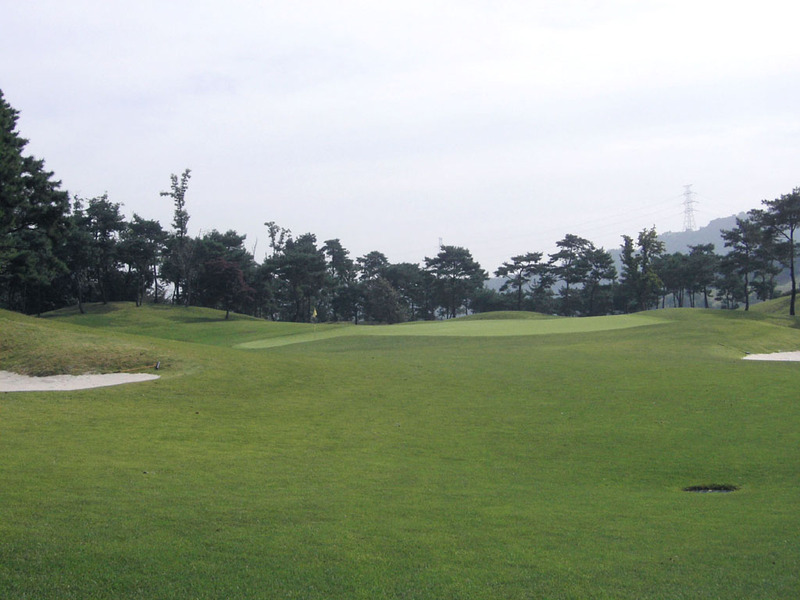 A dogleg to left with a dramatic layout. The tee shot is downhill. 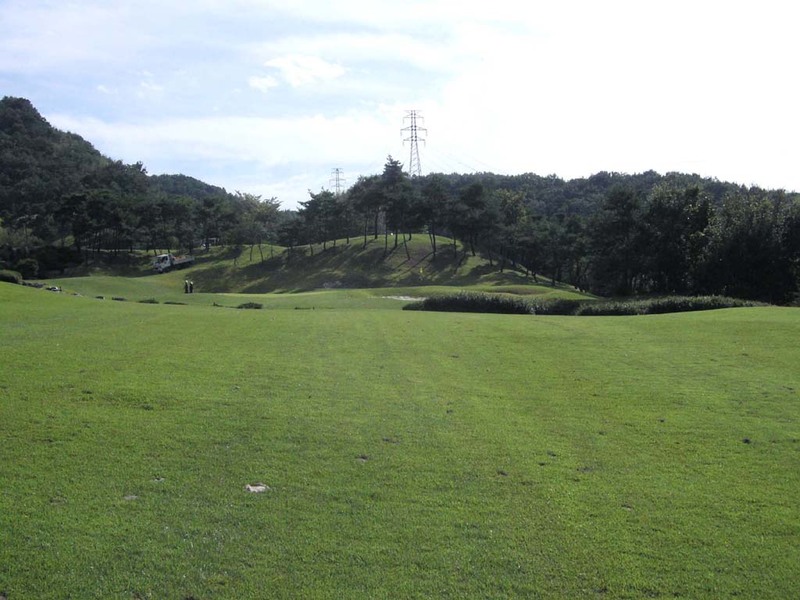 It will be an uphill lie for the second and third shots. Perfectly designed hole with great view. A par 3 over a lake. 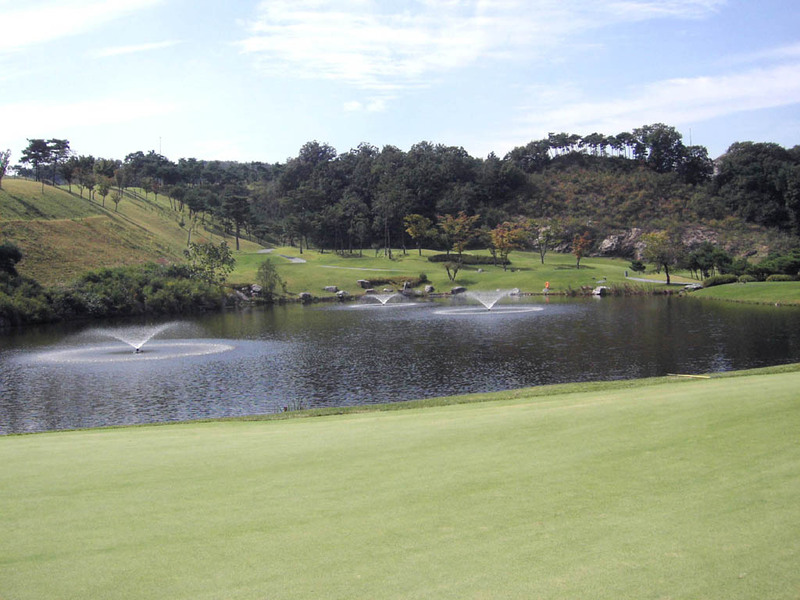 The players need to pick a right club long enough to hit the green since a lake waits right in front of the green. The green is wide and sloping from the back to the front. 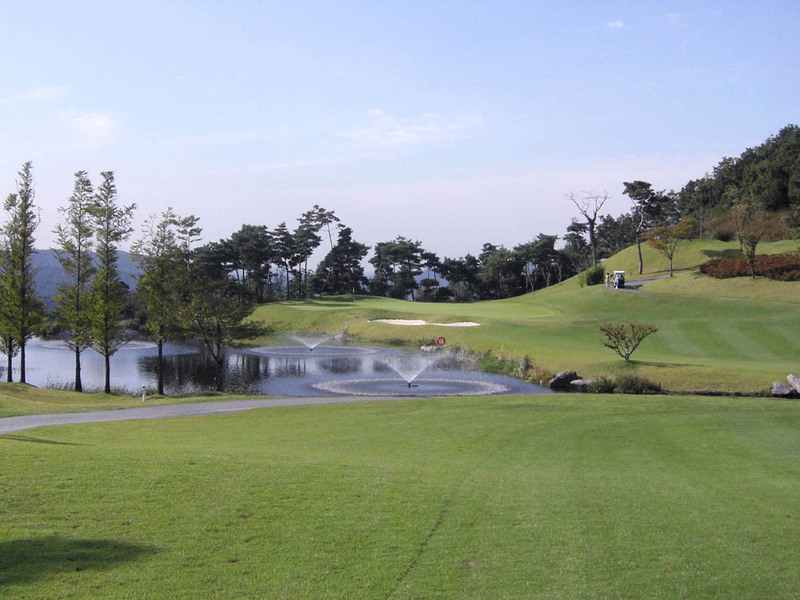 A slight dogleg to the right, a great par 5 reachable in two. 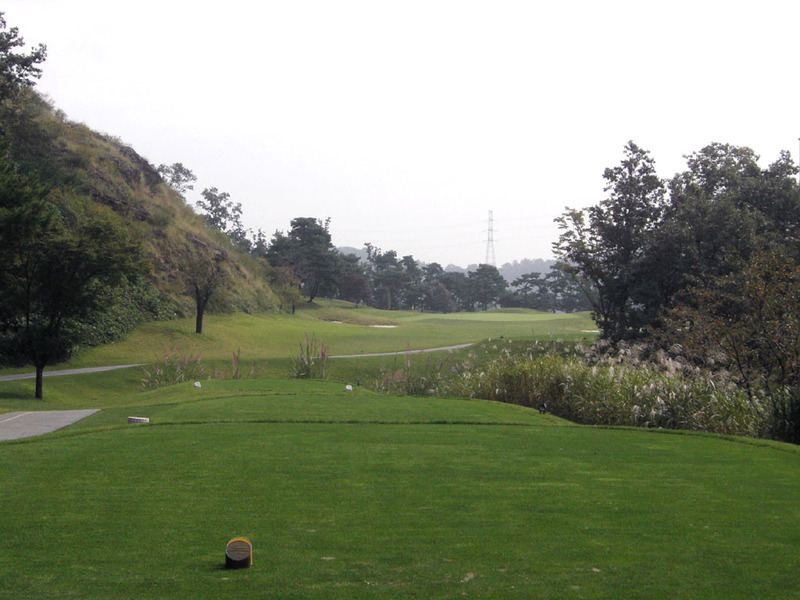 The tee shot is a sharp downhill which is from about 20 stories height to the fairway. From the tee there is a good view of a long lake down the right side of the left fairway before crossing in front of the green and another right fairway wrapping itself round the back of the green. 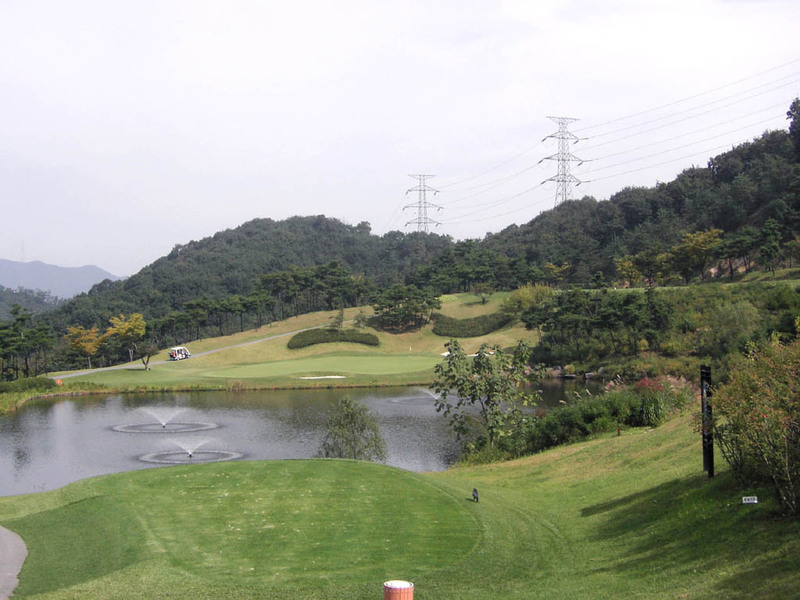 The second shot is to go across the lake from the left fairway either onto the green or the right fairway if you lay up. 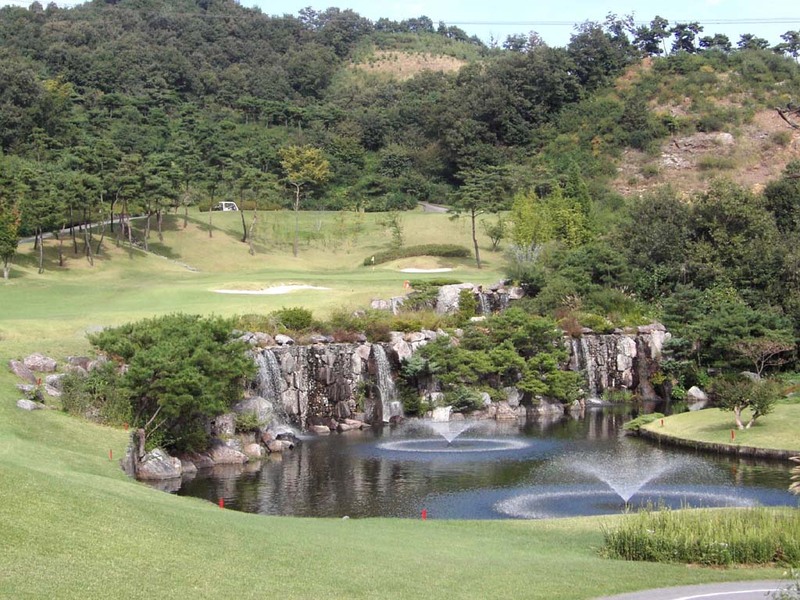 A par 3 over two-tier waterfalls. A left to right hitter need to be careful as water waits on the right side of the green. 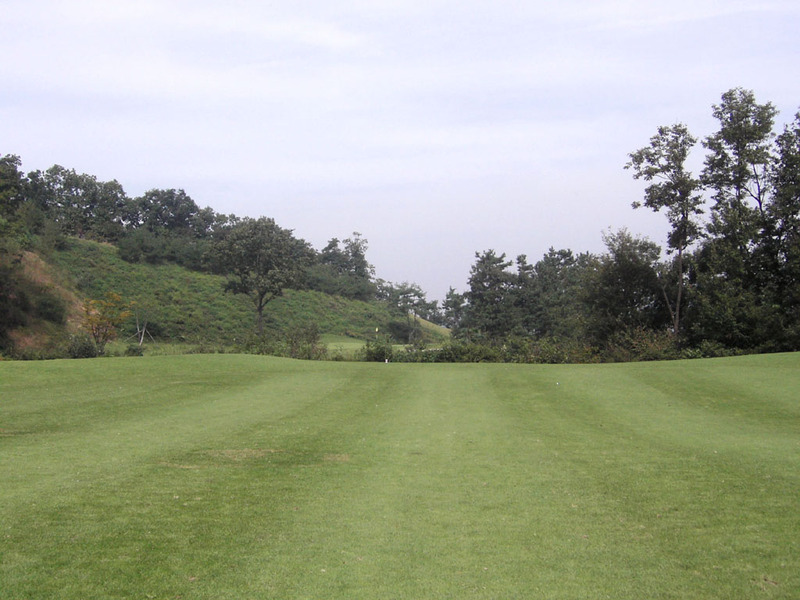 A relatively short, gentle uphill, dogleg to the right. 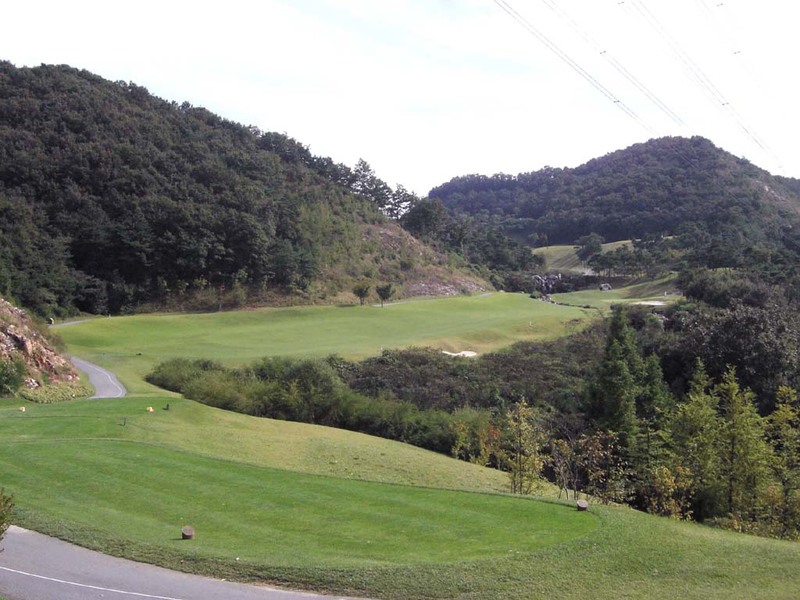 The tee shot over a ravine needs to be accurate since the landing area is squeezed by the ravine on the right and a mountain on the left. 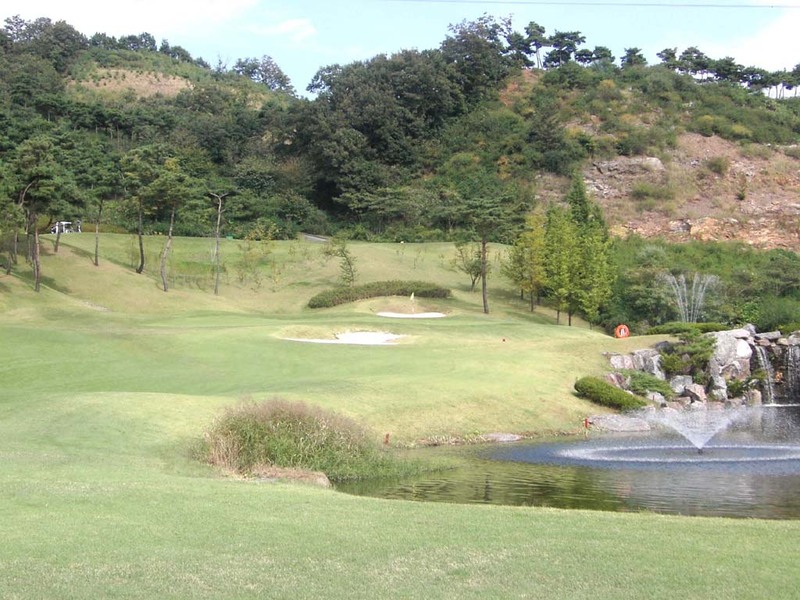 On the second shot, you need to watch out for a creek crossing in front of the green. A beautiful slight dogleg to the left. 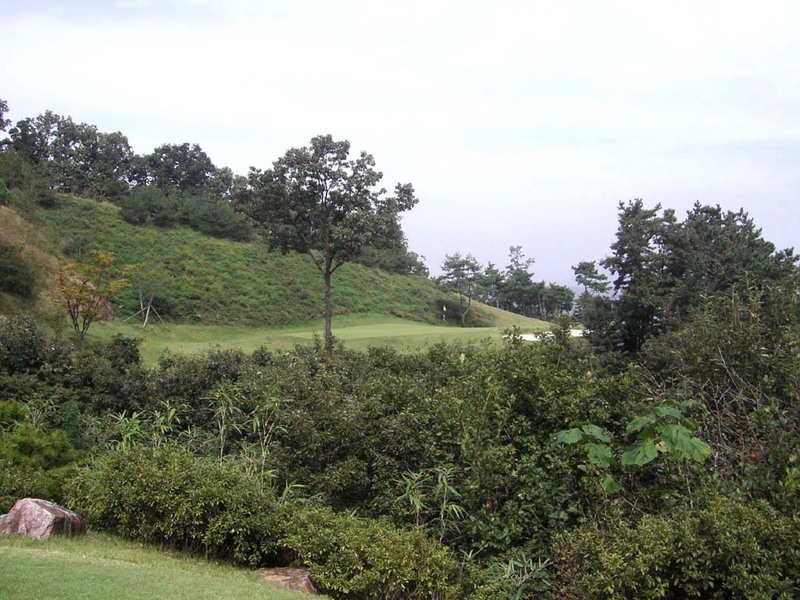 The tee shot is a gentle downhill. The second shot is over a lake. 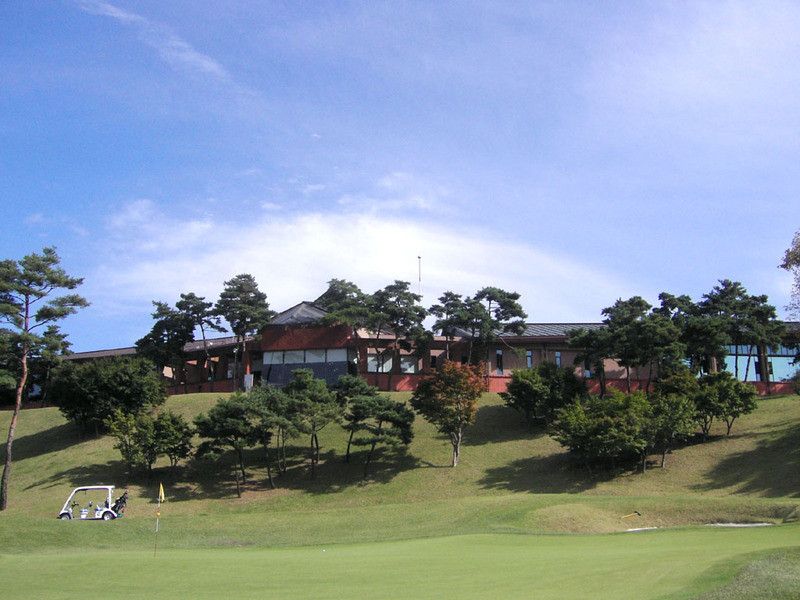 The green is guarded by water as well as a big bunker on the front. The undulation of the green is strong. 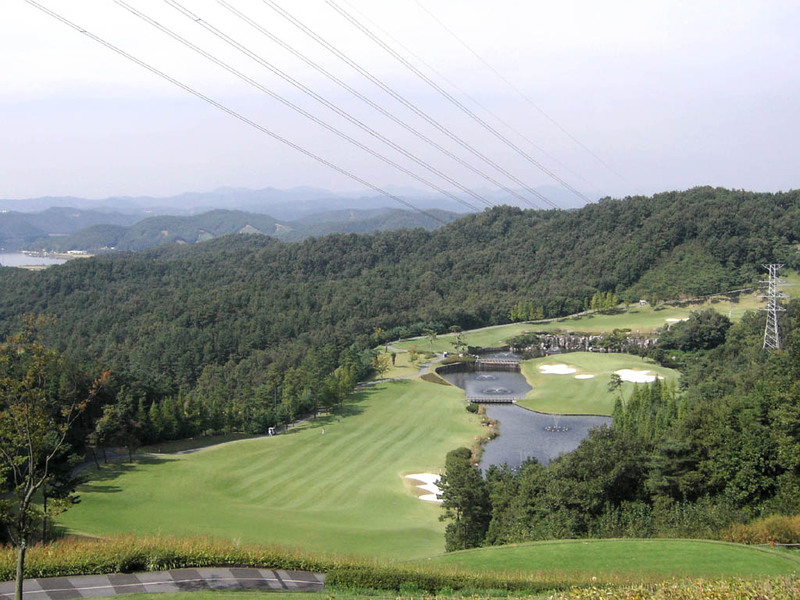 It takes about 90 minutes from Central Seoul by car. 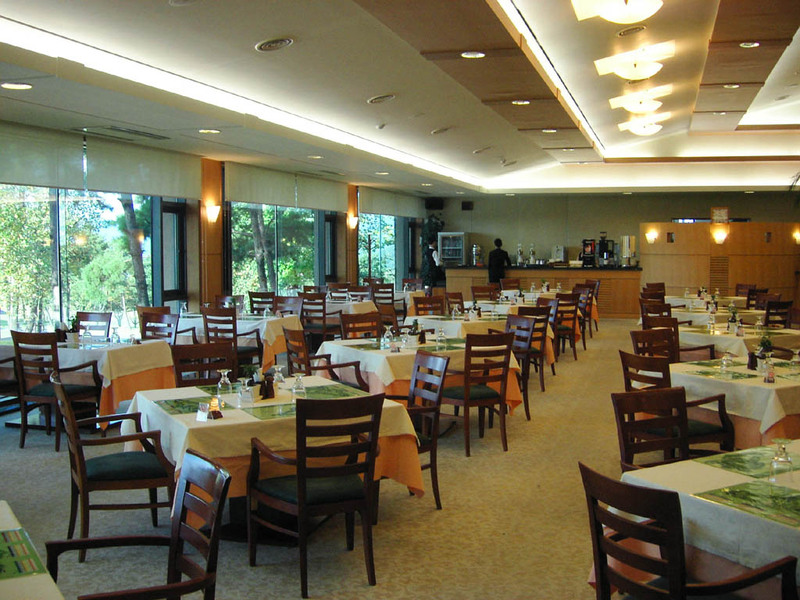 Visitors need to have a member’s introduction on weekdays and to be accompanied by a member on weekends. Anyone can play from the longest tees. 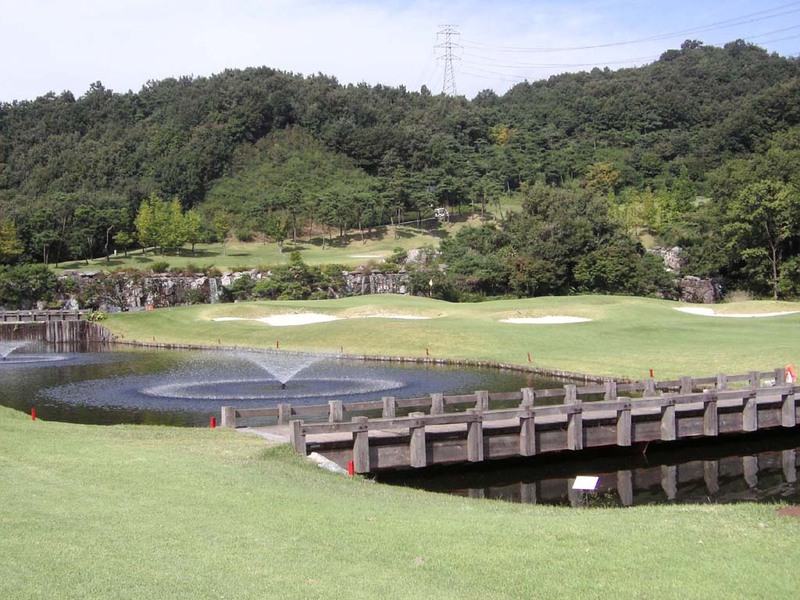 You can enjoy watching the golf course when you take a bath. 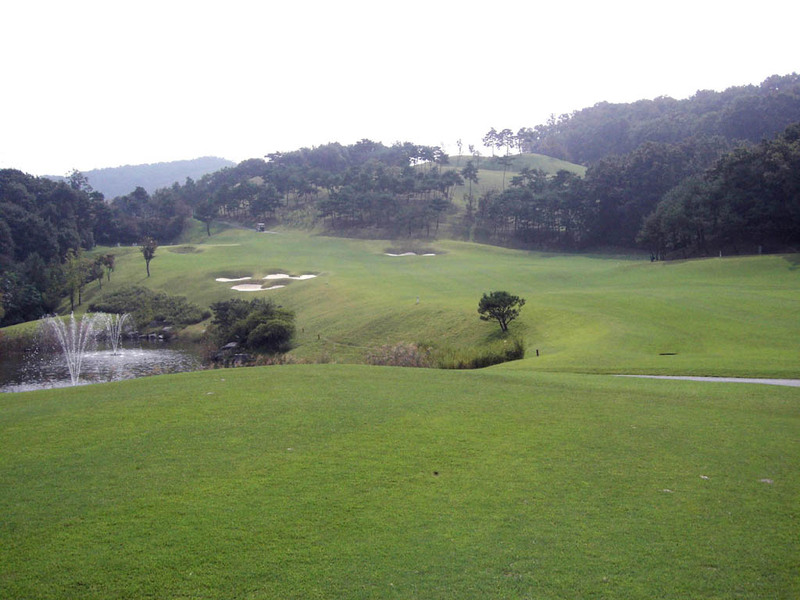 This is my second time to play golf in Korea. 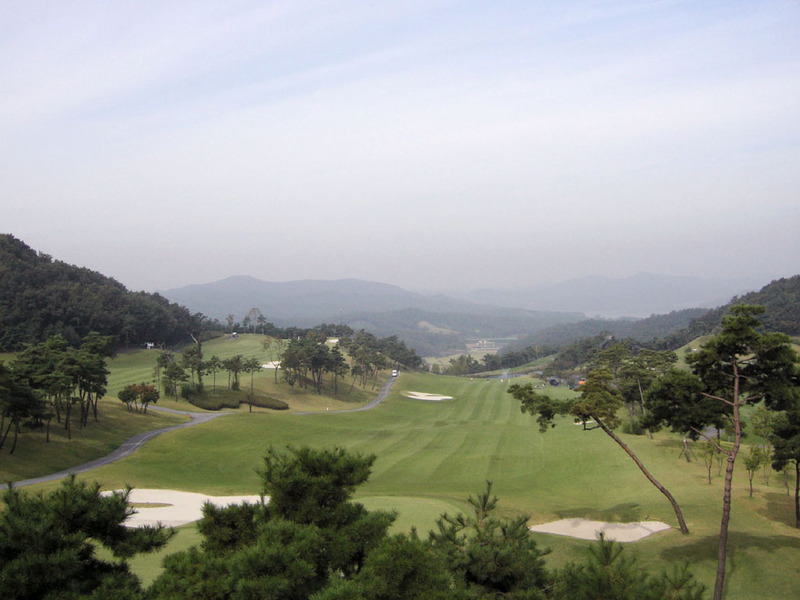 People say that Korean caddies (mostly ladies) are generally energetic and amiable. 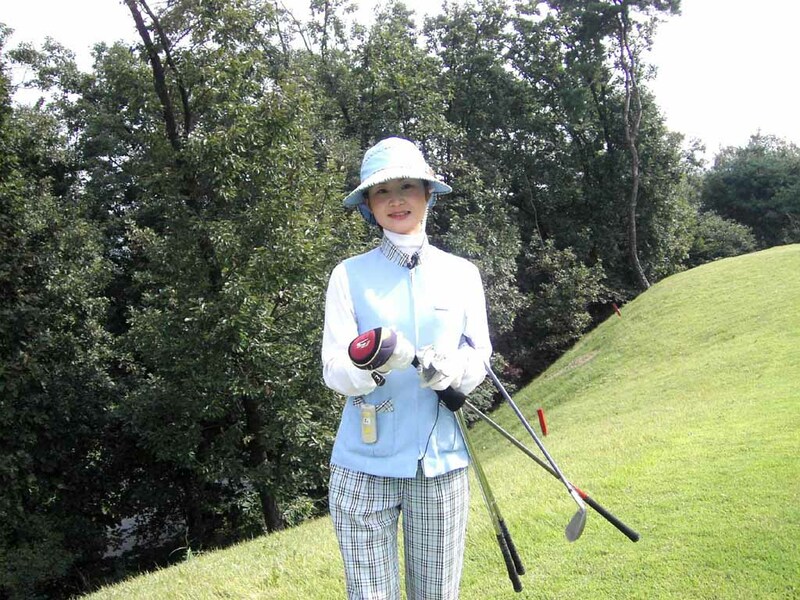 My caddie this time was charming and provided quick and effective support. 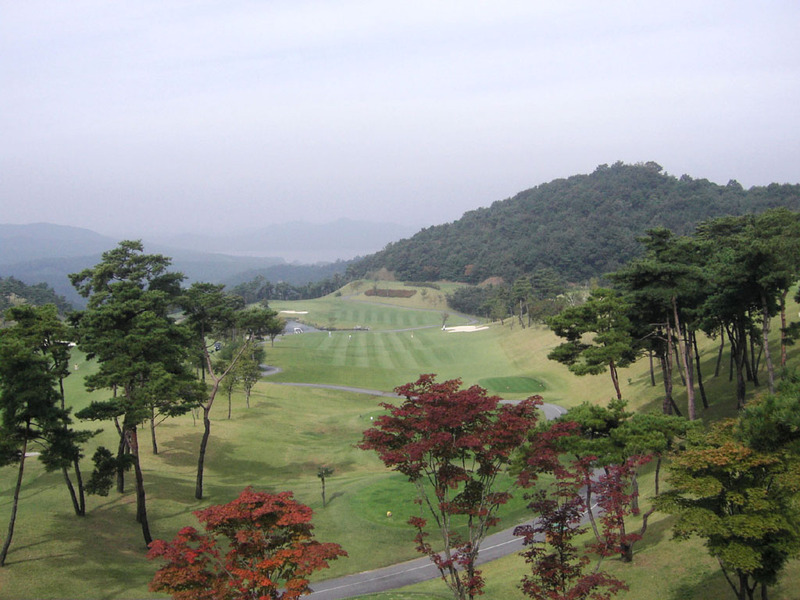 The course was chosen the 8th best course in Korea by US Golf Digest Magazine in 2003. 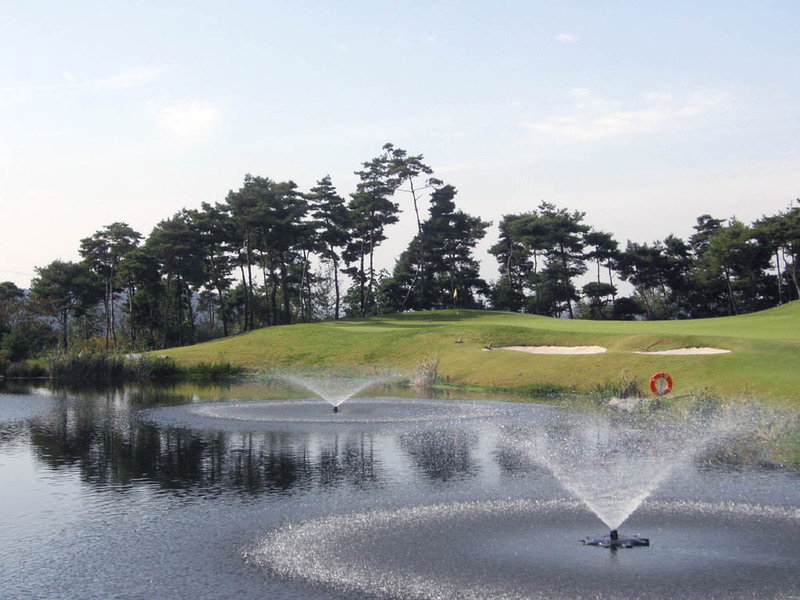 The other Lim Sang designed courses are Whasan CC in Korea and Earls GC in China.